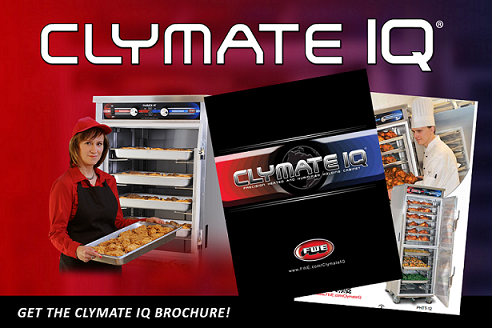 The Clymate IQ® is the next generation heated and humidified holding unit. This cabinet takes the guesswork out of holding food and provides superb results every time, allowing you to achieve extended holding times with precisely controlled moisture. With the Clymate IQ® you will be able to provide the best food quality by creating a precision environment for either long-term or short-term holding applications. The Clymate IQ® is especially valuable for use with cooked proteins, holding them at just cooked, top sellable condition for hours. Precision Heated Humidity Technology - PHTT series is a game changer as it provides precision control over a food's temperature - preserving moisture and texture. With precision control of both air temperature and the food moisture, the PHTT is able to balance relative humidity. Since food is comprised mostly of water, extended holding times can be reached with just cooked flavor and texture as foods are held at their optimal holding equilibrium. Heats up fast - The Clymate IQ® cabinets' intuitive climate control technology reaches the set humidity and temperature twice as fast as the competition - in just 30 minutes versus 75 minutes with the other guy. The intuitive climate control® technology automatically maintains the set levels of heat and humidity. Proper levels inside the unit means food is held under precise conditions, resulting in less waste and better tasting food. Simple to use - User-friendly, easy-to-read, easy-to-set, color-coded digital controls won't leave you guessing or needing extensive training to operate. Using these controls you will be able to dial in your desired settings from 10% to 90% relative humidity and 90°F to 200°F. Fast Recovery - When performance matters, you can count on Clymate IQ® to get back to the set temperature fast - you don't have to worry about losing heat and humidity if you open and close the door repeatedly during peak service times. Our lift-off self-closing hinges are designed to pull the door shut after it has been opened and released, avoiding loss of heat and humidity. Be alerted - If the door of your unit is open for too long (more than three minutes), an alarm will sound to let you know. Low water levels in the reservoir below the unit will also trigger an alarm, allowing you to refill the water without disrupting service. Consistency throughout - All Climate IQ® cabinets feature a unique push/ pull air distribution system to provide uniform temperature and humidity on every level, throughout the unit. That means no hot spots, and no cold spots top to bottom, front to back- keeping your food kitchen fresh and perfect. Place the unit anywhere - All units come with a tri-directional AC cord pocket to give you better plug placement and flexibility for a compact fit. Units are available in a wide variety of sizes to meet your specific needs. Fast Casual Ready - The Clymate IQ® flip-up doors (optional accessory) create the perfect solution for building individual orders of pre-cooked product without exposing the bulk of the load to the outside environment. With only 1/6 of a door opening happening at once, there's less heat and humidity loss for both the unit and the food product, so less recovery, less energy used and the absolute best possible product quality are the results. Unmatched ease of cleaning - The exclusive large volume, removable water pan makes clean up a breeze - just pull out the pan and the heating element will lift up for easy cleaning. FWE's unique removable and adjustable stainless steel tray slides accommodate a universal range of pans and trays and make for thorough internal cleaning. Built to last - FWE solid stainless steel construction is built to withstand continuous, demanding use and will outperform all other brands. With FWE's Quick Ship program, many models are available for immediate shipment, shipping with 48 hours. Quick Ship terms and conditional apply. To learn more, visit www.fwe.com/quick-ship. FWE offers a variety of features and options for our Climate IQ® units, to learn specifics, see literature, additional photos and get a quote, visit www.fwe.com/clymateiq.